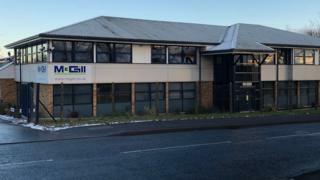 The administrators of collapsed Dundee-based construction firm McGill have named a preferred bidder to buy the business. The company went into administration on 1 February with the loss of 374 jobs. Catalus Energy Investments Limited have been granted a "short period of exclusivity" to acquire the business and certain assets. Joint administrators KPMG said both parties were hopeful a transaction could be agreed. Blair Nimmo of KPMG said agreement of the sale would be subject to due diligence and contractual agreement. McGill, which had bases in Dundee, Edinburgh, and Glasgow, had operated since 1981.